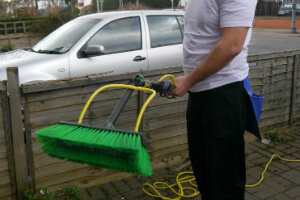 Haringey N Commercial & Domestic Window Cleaning | Quality Property Care Ltd. Using specific inside window cleaning equipment and kits we are in a position to get every last dirt spec from the inside of your windows, from the sills, to the frame, the insulation, the window, knobs and even the blinds. We will not perform maintenance on said windows, simply cleaning until spotless. All detergents used by Quality Property Care Ltd. experts are suitable for the appropriate cleaning of your windows, with high dirt buildup prevention effects, and no window or sill damage. To effectively clean inside, we use a sponge, a squeegee, a bucket, some pure water and a lot of practical experience. Conservatories and conservatory roofs too. So whether you are in dire need of the professional commercial windows cleaning service or the home windows cleaning service delivered by Quality Property Care Ltd., all you need to do is reserve the service or services you need, and you will ensure that the light shines brighter in your home or office again. The commercial-domestic-window-cleaners from Quality Property Care Ltd. are all very thoroughly trained, vetted and experienced. 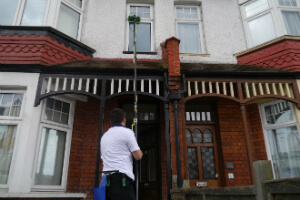 The company has been offering qualified windows cleaning to all residents and businesses in Haringey N since 2005. The managers have invested in the newest technologies in the window and other cleaning industry. The purified water telescopic fed poles they use are very reliable and safe for the windows and for PVC frames and sills. The company also offers rope access window cleaning for windows situated above the 4th floor for domestic windows cleaning and commercial windows cleaning too. The service is very quick and efficient, and can be provided on any chosen day, weekends and bank holidays included, with no additional charge. Same day emergency windows cleaning service is also available. To reserve us give 020 3746 4287 a call where a crew of specialists is waiting to assist you anyway they can. Get in touch with us totally free at the given number to receive info to questions and book the best cleaning support in London.